It was our last day of teaching at the conference and what a day it was. We started our day by walking about 2 miles down towards one of the main rivers in the area at about 6:30 AM to do some baptisms. What a special privilege and honor it was for us to participate in such a glorious event. 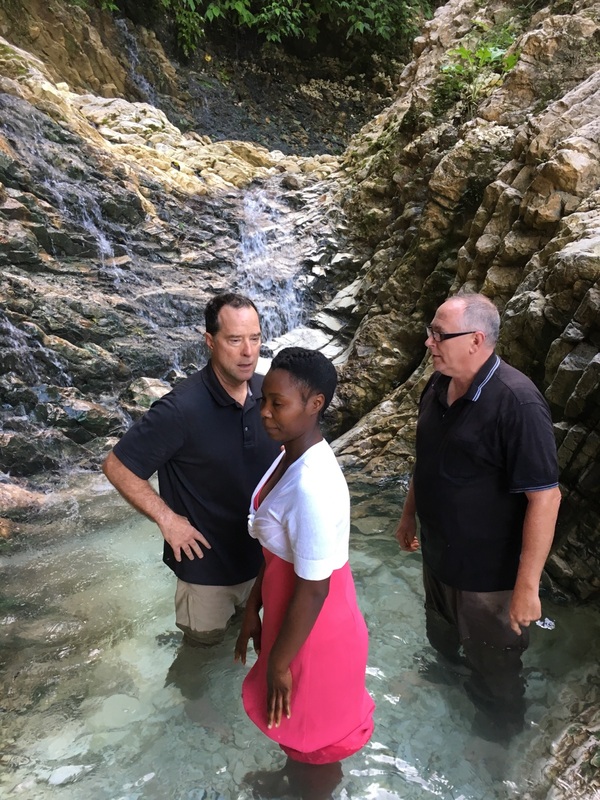 I got to baptize two young Haitian women. The scenery was breathtaking. Next we started our last day of teaching at the Pastors Conference, ending with a graduation and certificates handed out to each pastor. We met with several of the leaders of the conference and they would love for us to come back. The teaching, even with a translator, seems to have been very well received. After that we moved into a 2 hour ordination in which they ordained 1 pastor, 1 deacon and 2 deaconesses, again a very special event in the life of the church in Haiti. 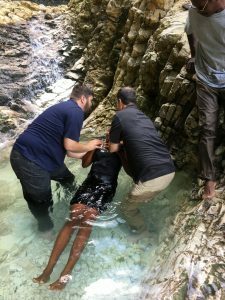 The people of Haiti are a very warm people, a “make do with what you have” people, a people who has seen catastrophe after catastrophe and yet nary blink an eye, they just take it in stride as the norm of their lives. 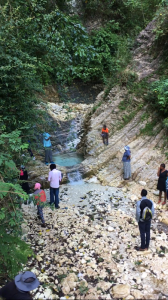 There is no middle class in Haiti, you have the very poor and then the very rich. How poor you may ask? So poor that they sell dried dirt to eat so that they get enough minerals into their system. Something we as Americans cannot relate to. Our other team of missionaries is helping to reconstruct a school and an orphanage. The other night as they were preparing supper, one of our young ladies “Emma” was peeling potatoes for their meal at the orphanage kitchen. They turned on the gas stove (which is to the left of the potato peeling station) that hadn’t been used for some time in order to boil some water. As the stove warmed up and Emma was peeling her potatoes on the counter a huge 10 inch rat scurried out of the stove moving towards the right, across the peeled potatoes, in front of Emma, in front of the sink and under one of the kitchen cabinets. What was the result of such a large undomesticated rodent attack? Emma screamed, her big macho dad Steve screamed too, those who witnessed the event described Steve’s scream as one that would come from a high pitched 2nd grade girl. The rest of the men in the kitchen quickly grabbed for brooms to protect themselves from this large flesh-eating rodent. One of the men was able to scare it out of the cabinet and onto the kitchen floor. 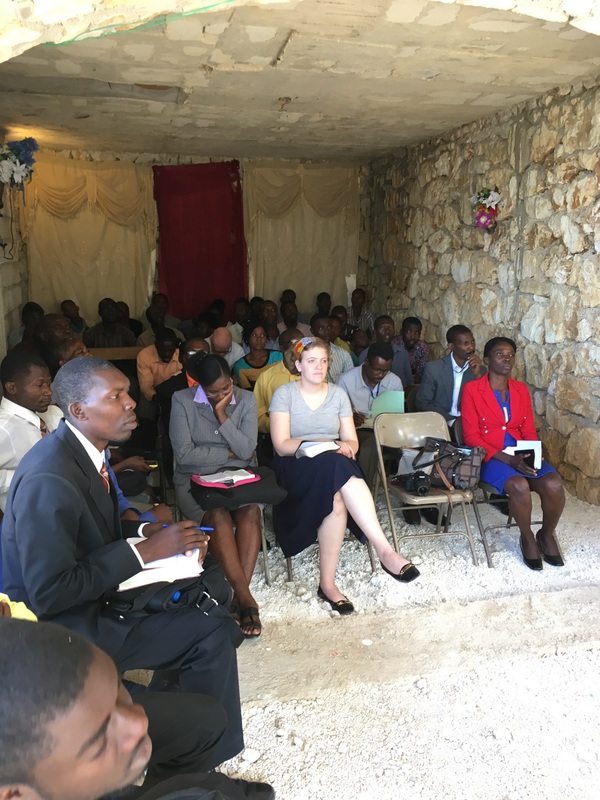 And just as their lives were flashing before them and there was no hope of survival, a small 6 year old Haitian boy looks in through the opened doorway and sees the crazed despair on all the eyes of these American missionaries. The little 6 year old boldly walks into the throes of death and as quick as the super hero “Flash” grabs the tail of this most vicious of rodents, slams the 10 inch rat on the cement and kills this arch enemy to the cheers of one and all. I can’t wait to sleep on the floor again tonight! We had 63 pastors. It doubled from their last conference. Gathering for the morning baptism at the mountain stream.